Cardinals cards and more from @acrackedbat migrate northwest for the winter. Last fall, I decided to part ways with a J.T. Realmuto Topps Heritage autograph (on-card, of course!) that I had been hanging on to awhile. I really like the on-card autos in the set, but with Realmuto's growing presence in the game and my need to return a little generosity in the world, I decided to send the card over to a home that it was more suited for. That's where Julie from A Cracked Bat came in. Some day, I'll get motivated to acquire some more Heritage autos that are more suited to my collection. I think I owe myself at least one. Julie sent over a bunch of Topps Heritage High Numbers needs from the most recent set, including Cardinals cards and set fillers. By mid-summer, the flamethrowing Jordan Hicks was starting to show up in every set. This isn't, unfortunately, something that tends to last for most relievers. 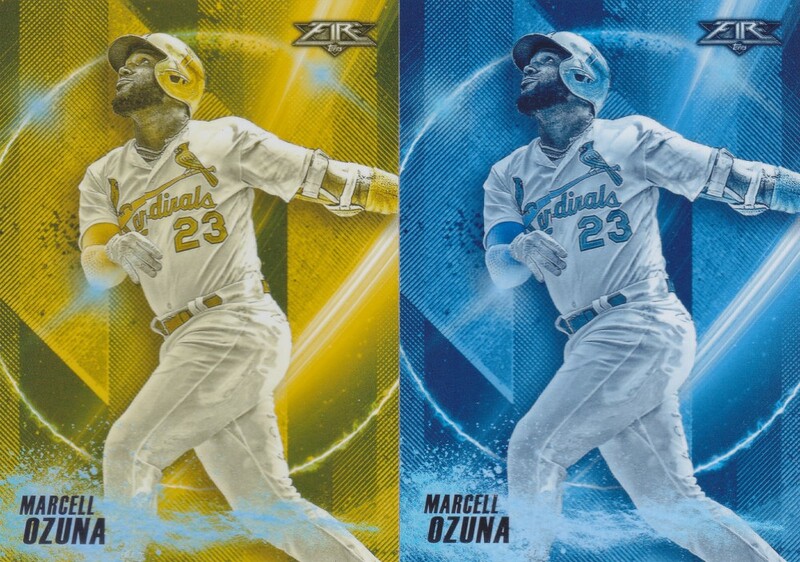 Last year, Topps paid tribute to their 1983 set with some of their inserts in the flagship set, and Chrome'd up versions in their (well, duh) Chrome set. 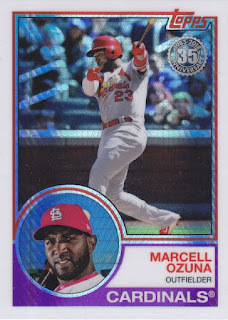 More Marcell Ozuna (x2)! 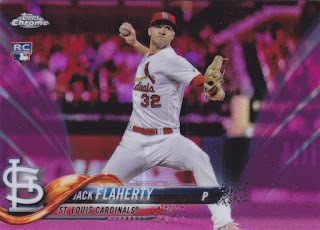 Here is the Cardinals left fielders on a part of parallels of inserts (what?!) 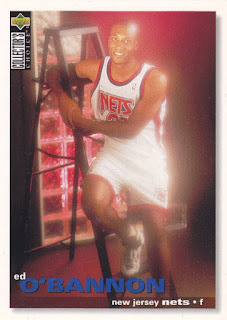 from last year's Topps Fire set. Nice. Low numbered relief pitcher alert! Low numbered relief pitcher alert! 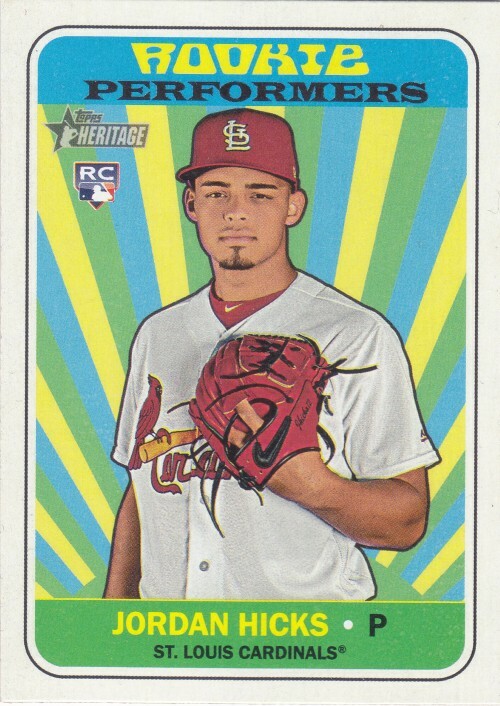 Kevin Siegrist, who was drafted in like the millionth round some years ago, doesn't even really fit in frame here. Does Panini have any idea what they're doing with their fancy high end baseball stuff? 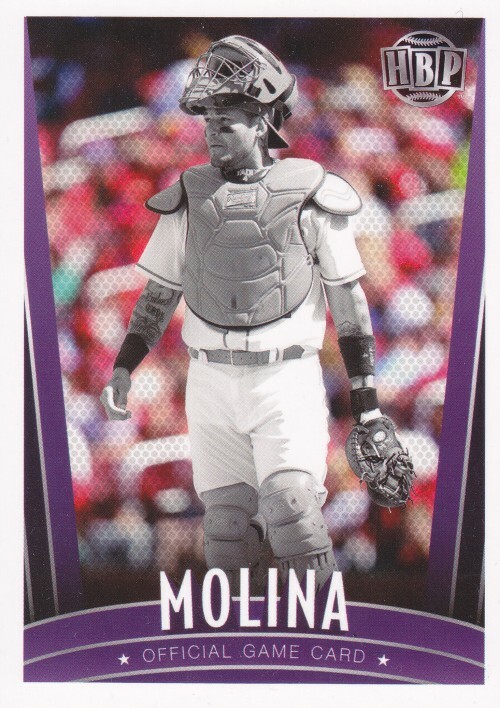 Here's one of those awkward greyscale Honus Bonus cards that someone on the internet quickly shut down back in 2017. I love these for some reason. I guess if you're going to go with an unlicensed product, it's cool to go super weird with it. Finally, as mentioned, there were plenty of 2018 Heritage High Numbers cards to go around. Hotshot rookie Juan Soto and the perpetually unsigned Bryce Harper are almost doing the "Spider-Man pointing at himself" meme thing here, which would be pretty weird because they're not the same guy. 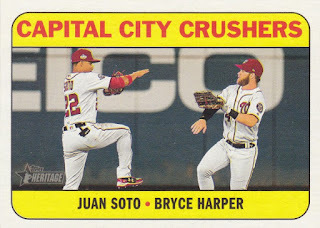 Soto might be the superstar outfielder of the future in Washington, if there is even a Washington left in the future. 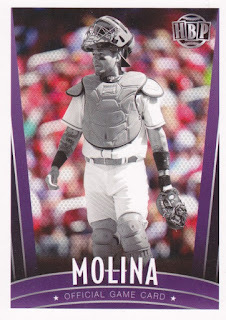 The internet might not have liked it, but I think that purple Molina is pretty nifty looking! Flamethrowers can stick in checklists - if they can stick in MLB. The faster they throw, the shorter their careers, it often seems. 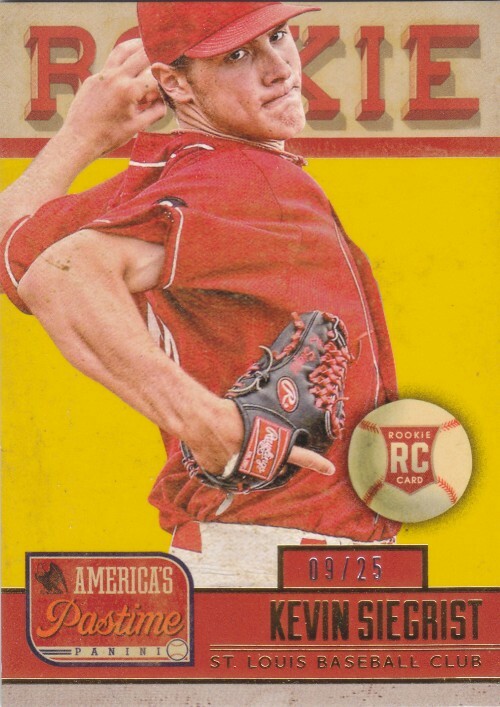 I pulled some Honus cards as part of a repack. I was very not impressed. 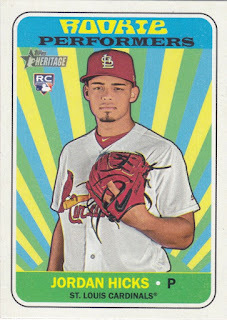 That said I like Molina and I'll give this card the benefit of the doubt. thanks for the Heritage help! I'm close to completing the set! The Realmuto auto was a sweet surprise, a perfect fit to my collection!